Remember the Razer Edge, the gaming tablet/laptop wunderkind that left an indelible mark on CES 2013? Those who've kept their ear to the ground for machine availability are reaping their reward today: Razer announced pre-order and shipping times for both the basic model and Razer Edge Pro. Pre-orders kick off March 1 at 12:01 a.m. PST, available through the firm's "where to buy" web page. So far, only the U.S. and Canada have purchasing powers. Units will ship off later in the month, and Razer plans to charge $999.99 for its base variant and $1,299.99 for the heftier Pro version. For those that need a refresher, the Edge is a Windows 8 tablet/laptop hybrid, yet so much more. Though the parts will be sold separately (also available for pre-order March 1 and shipping concurrently) a gamepad controller, home console dock and extended battery accessories contribute to the Edge's allure. Customers can expect to pay $249 for the gamepad controller, $99 for the console dock and $65 to nab that extra battery life. The Edge runs on an Intel i5 processor and has 64GB SSD, while the Pro welcomes an Intel i7 into the mix. Customers have the option of either 128GB or 256GB SSD for the Pro, though will have to fork over $1,449 for the GB boost. The models feature Nvidia GT 640M LE graphics. Screen wise, the multi-touch HD display takes up 10.1-inches and has a resolution of 1366 x 768. Normal Edge owners will get 4GB of DDR3 memory while Pro peeps see a double bump to 8GB DDR3. Finally, both feature stereo speakers, HDMI, a front-facing, 2MP HD webcam, array microphones and a USB 3.0. "It's a full-fledged PC," he said, meaning it can play any current PC game title. "As a tablet it can play any touch-enabled game, like Civilization V, for instance." 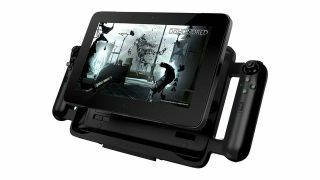 Edge can also play any X-input support game in gamepad mode plus act as a standalone PC with mouse and keyboard hanks to its multiple USB ports and HDMI on the home console dock. Razer plans to launch an optional keyboard dock during Q3 2013. We're curious: Will you buy one?